That’s a lot of camels! Modern military operations in the rugged mountain fastnesses of Afghanistan are battles against the forces of nature as well as clashes between men. 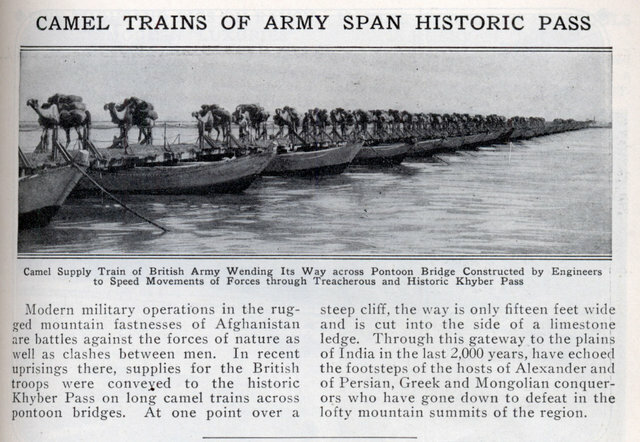 In recent uprisings there, supplies for the British troops were convened to the historic Khyber Pass on long camel trains across pontoon bridges. At one point over a steep cliff, the way is only fifteen feet wide and is cut into the side of a limestone ledge. Through this gateway to the plains of India in the last 2,000 vears, have echoed the footsteps of the hosts of Alexander and of Persian, Greek and Mongolian conquerors who have gone down to defeat in the lofty mountain summits of the region.